To have tomatoes in time for summer, start planting soon. Cherry tomatoes are a good option for those with only a small amount of space. The fabulous aspect of cherry tomatoes are is that the plant itself is compact, easy to grow, has fairly disease-resistant cultivars and you can grow them for much of the year. If you’re really keen, you could keep cherry tomatoes growing all-year-round if you didn’t mind it being inside. A cherry tomato plant needs to be put in a sunny, sheltered area. Plant about half a metre apart in the garden, or put them in a pot, a tub or even just a plastic bag full of soil and well-rotted compost (not fresh manure). 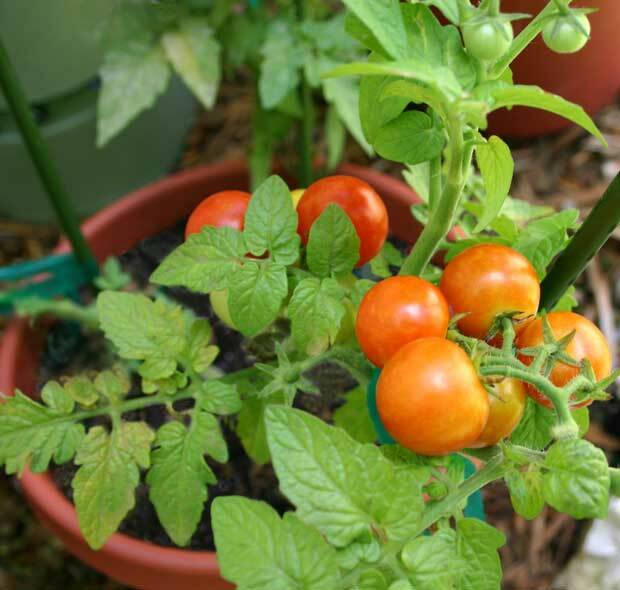 The key to great tomato production is keeping them well watered, so by having them close at hand in a pot, especially on your patio or deck, you can easily remember to give them a drink, and grab them when ripe for the freshest-ever addition to your salad. This is a yummy red cherry, very quick to grow, good fruit set, split-resistant, sweet, firm. Compact plant, determinate. Just gorgeous golden cherry tomato, usually a deep yellow colour, early to bear fruit. Slightly oval in shape, tends to be mostly seedless, determinate. This sweet cherry tomato goes a cream to pale yellow colour, very attractive and almost impossible to not eat before you get back to the house. Indeterminate. Possibly the original cherry tomato, sourced from Mexico, sweet flavour, some natural resistance to disease. This sweet red cherry tomato is perfect for a pot or window box as it is a dwarf bush, quite disease resistant and easy to grow. Sweet, succulent fruit from this award-winning hybrid cherry tomato from Yates, also known to be disease and pest-resistant. In the descriptions above you’ll see cherry tomatoes are determinate or indeterminate. 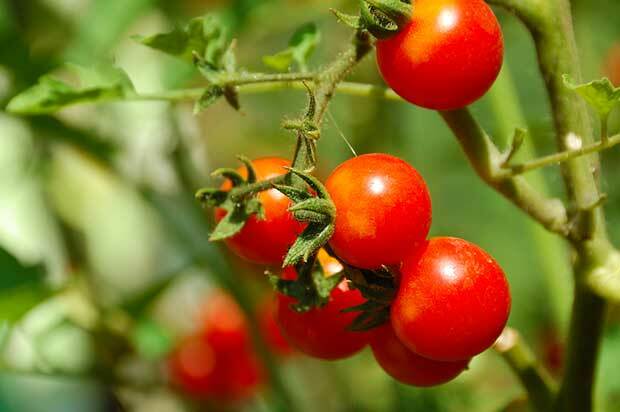 Determinate tomatoes will grow to a certain size, flower, then produce a single crop. Indeterminate tomatoes are ones that grow stem and flowers at the same time, require staking and produce fruit over a long period of time. These canapés are easy to make and the garlic gives them a lovely kick. Alternatively spread the cooked croutes with pesto or tapenade. Preheat the oven to 200°C. Cut the baguette into 24 thin slices. Place on a baking sheet and brush with the olive oil. Place the cherry tomatoes on the same tray and bake in the oven for 6 minutes or until the croutes are lightly golden. Remove the croutes from the oven and continue cooking the tomatoes for a further 6-8 minutes until the skins split and become very soft. Meanwhile rub each croute well with the cut side of the garlic cloves. Remove the tomatoes from the oven and place them on the croutes. Leave to cool slightly, garnish with the basil leaves and serve. If you can’t get hold of fresh thyme, you can use fresh basil. This is also delicious with sliced mushrooms in place of the tomatoes. Preheat the oven to 220°C. Place the cherry tomatoes in a roasting tin, drizzle with 1 tbsp of olive oil and season. Roast on the highest shelf of the oven for 8-10 minutes or until the tomatoes are just starting to pop their skins. Meanwhile slice the beans into thin ribbons and blanch in boiling salted water for 1-2 minutes until just tender. Refresh under cold running water and drain well. Place the beans and tomatoes on a serving dish. Remove the leaves from the thyme and mix with the remaining oil and lemon juice. Season to taste, pour over the beans and serve straight away.